Next Merry Xmas and Happy New Year 2019! On June 5th 2018, COMEX SA and Zero 2 Infinity (Z2I) successfully demonstrated their ability to perform Maritime surveillance over a course of a day with high altitude platforms (HAPS) launched from a research class vessel. 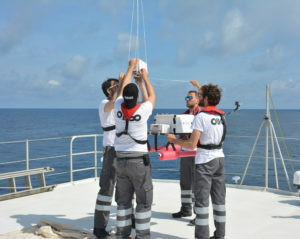 The launches were part of the Triton Campaign, which is funded under the Neptune project from the European Commission H2020 program, with Pôle Mer Méditerranée and Eurecat as project coordinators for COMEX SA and Z2I respectively. The objective of Triton is to launch HAPS, in this case high altitude balloons, from a medium size vessel at sea and to overfly a specific area on the ocean surface by taking images of it over the course of a day. For the launch campaign COMEX’s Janus II was used as the launching platform. The Z2I engineering team prepared and released the high altitude balloons. As per the trajectory prediction software, the coordinates 42°36’58’’ 4°48’6’’ were selected as the first launch location, which is approximately 80 km offshore Marseille. The mission began at 02:00 am from Marseille Pointe Rouge port and the first launch was performed at 08:00 am. 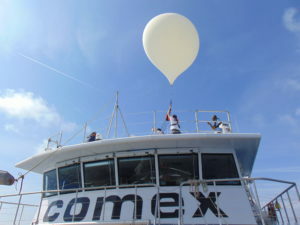 The target for the high altitude balloons was COMEX’s Minibex vessel (representing a maritime zone of interest), which was located approximately 20 km away from the Janus II vessel. The trajectory prediction software was updated every two hours and the second and third launches were performed at 10:00 am and 12:00 am respectively. All three balloons’ trajectories were closely monitored to verify their path over Minibex and to predict their landing spot. The GPS tracking information from the balloons proved that all three of them were indeed successfully able to fly over Minibex at an interval of two hours from each launch. All three payloads were then successfully recovered from the sea. 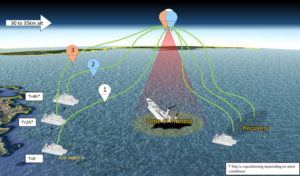 The Triton Campaign proves that high altitude platforms can play a vital role in Maritime surveillance, oil spill monitoring over time to determine the best course of action, marine life monitoring, etc. In addition to maritime applications, such campaigns can also be used to validate various space technologies, conduct atmospheric research, and even create marketing campaigns. 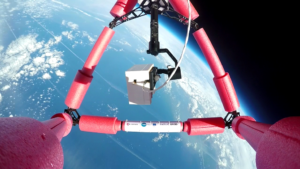 Furthermore, the team also successfully launched a fourth balloon containing instruments implemented by the IM2NP (Institute of Materials, Microelectronics, and Nanosciences of Provence UMR 7334 CNRS – Aix-Marseille Université). This fourth payload, developed by the Detection, Radiation and Reliability Department (DETECT) of the IM2NP made it possible to federate skills and know-how in different fields like energy transmission, radiation, detection, and instrumentation around a common project. The objective of this mission was to test the IM2NP sensors in Space conditions, where severe conditions apply, for example temperature, humidity, CO2, solar and UV radiation, neutron radiation, and heat flux. The Z2I team designed an instrumented a gondola that allowed the monitoring of the behavior of on-board sensors in real time. The success of this first launch opens the door to new scientific missions dedicated to the instrumentation for Space.